The Hayward Gallery, Royal Festival Hall and the Purcell Rooms on London’s Southbank have come out as a “Butch Queens”. Over the years they have learnt acceptance over their hard concrete brutalist exteriors and are now finding comfort in freely decorating themselves with various extravagant accessories designed by some of the worlds best contemporary artists. Collectively they now have: coloured staircases, a series of neon artworks, a hotel room in the guise of a boat on the roof, along with various spiked stud accessories strewn across their tops. 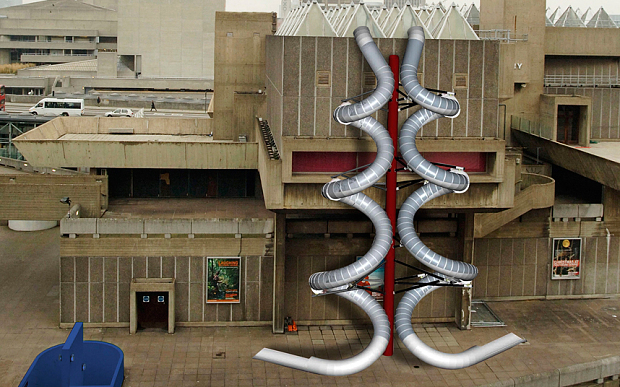 The latest and possibly most flamboyant edition, however, are a set of spiral slides which travel from the top all the way to the ground floor, designed Carsten Höller for his latest show: Decision which will be showing from 10th June – 6th September. The Hayward has acquired this stunning statement piece, second hand after being worn my mega-star, Tate Modern. It most definitely does not look worn however, and The Hayward is “owning” this extreme accessory. We wish the Southbank Trio all the best in their new found ways and we look forward to enjoying more gems being added to their exteriors.